Great Gulf Views & Convenient Ground-Floor Walkout- Steps 2 the Beach! Enjoy pampered relaxation in our beautiful ground-floor condo overlooking a palm-rimmed lagoon and the Gulf of Mexico. You can walk directly out from our patio to the pool and beach - each about a minute's walk away... The convenience is wonderful- No climbing stairs or waiting for the elevator! The unit is decorated in light Floridian decor with many luxury touches such as crown mouldings, brass accents, flat screen TV's and new carpet and tile. The unit features a new open floor plan, new baths and vanities, textured walls,ceiling fans in each room, large tiles in the kitchen and bath. Everything is in beautiful condition. We visit often and keep the unit updated and well maintained. We have a king size memory-foam bed in the romantic master bedroom, brand new twin beds in the guest room and a queen sleeper-sofa with memory foam topper in the living room. Each bedroom has direct access to its own private bathroom. Our screened lanai (patio) is accessed from both the living room or master bedroom. 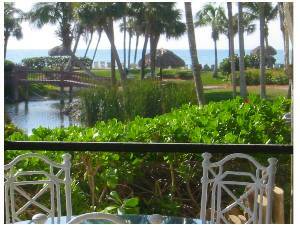 We love to have our meals on the patio and contemplate the Gulf of Mexico or watch the exotic birds in the lagoon. Pointe Santo is a lushly landscaped tropical treat! On-site amenities include tennis, shuffleboard, BBQ grills, beach side lounge chairs and free wireless internet throughout the complex. Located on the bike path, Pointe Santo is convenient to scores of restaurants, shopping, groceries, a movie theater,and the "Ding" Darling National Wildlife Refuge. We also use an on-island full-service rental agency to handle your reservation information promptly and confidentially. They also serve as our local source to quickly respond to any need that may arise during your stay so you can relax and enjoy all that Pointe Santo and Sanibel have to offer! Fully equipped, spacious kitchen with breakfast bar. Everything you need is provided except the food! Filtered water is available at the sink. Enjoy morning coffee or an afternoon drink on our screened patio overlooking the gardens and the Gulf of Mexico! The Gulf of Mexico backdrops beautiful tropical gardens and lagoons, so close you can hear the waves while you sleep. 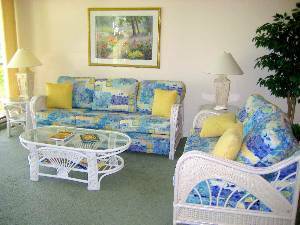 Comfortable new living room furniture in a light Floridian style. New wallpaper, tile and fixtures provide a sense of luxury. 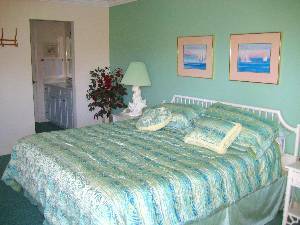 Romantic master suite with walk-in closet and private bath and a view of the gulf.
" 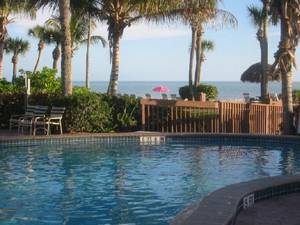 My friends and I had an awesome time at this condo in Sanibel island. It was very clean and very close to the beach! the owners were very nice and helpful during the initial renting!" View out of the condo is wonderful!" "Well stocked kitchen-waffle iron-cheese spreaders, wow! Fold out couch with memory foam topper- super comfortable. Kids loved the activities in the clubhouse. We want to return." "The condo met our needs beautifully. It was nicely updated and contained everything we needed to enjoy our week's stay. It's a quick walk to the beach and pool and we used the barbecue grills several times. All in all, a very nice place to stay." "Point Santo is located centrally on the island in easy distance to wildlife areas, groceries, post office, shopping. You can bike to these locations easily. The complex has a pool, hot Tub, sturdy lounge chairs on the beach, lots of grills, fabulous shelling beach and you can see both the sunrise and sunset from this beach. This condo is very well equipped including a spacious kitchen with everything you need. The refrig has water and ice in door, lots of good knives, 2 sets of nice dishes. The unit is up to date throughout. We enjoyed reading the guest book which has stories of the experiences of other guests including wildlife sitings, restaurant experiences, activities to try etc. Also the owner has a book which gives lots of information about the island. The clubhouse has a computer and printer for printing boarding passes as well as puzzles, games and movies you can take out for your entire stay. The sleeper sofa has a memory foam topper which makes it very comfortable for an adult. A nice feature is that you can go outdoors on the lagoon side and lock the sliding doors there instead of having to go out the back door and around. The first floor location is a plus for going to the beach, pool etc. I've stayed in other units at Point Santo and this is a step above. We plan to stay here again next year. It's paradise!" "This was our 4th annual visit to the condo, and we've had a great time every year. The condo is great: it's always in terrific shape - clean, well-kept, fresh. The amenities are just what we need - dishes, appliances, etc. are also well-kept. The location is great. 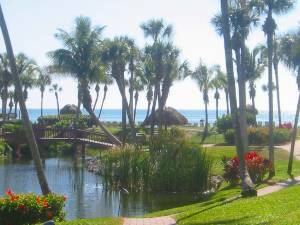 Sanibel Island is a mellow place for a relaxed vacation with easy access to shopping and beaches. There are good restaurants and a couple of really great grocery stores. 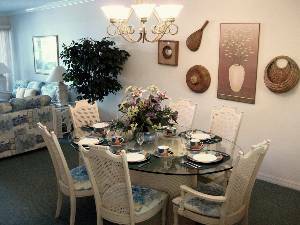 The condo complex itself is also really well-maintained, and we love the pool and the barbecue grills. We're so happy to have found this spot." 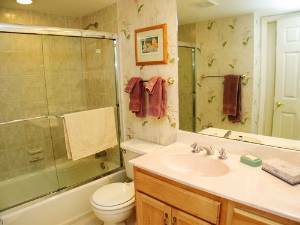 "This is a great ground floor condo unit with direct access to the courtyard. This is great to have with kids...no running around to the parking lot side to get into the unit. The unit is clean and nicely appointed. I would recommend this unit to families and people who don't want to climb stairs. Very convenient! We have stayed in this unit for two years in a row now. It offers us everything we need." 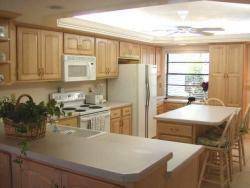 "Beautiful surroundings, comfortable living in a tropical island setting. Whether it was sitting by the pool, walking on the beach collecting shells or splashing in the ocean waves - it was a vacation dream. Loved the condo, loved the beach, loved Sanibel Island. I've rented Florida condos at Siesta Key & Panama City, but this one at Sanibel was by far the best experience. Without a doubt, I will to go back to Pointe Santo in the future. This ground floor condo was just a short walk to the beach or pool. I loved that lounge chairs were provided in both sunny & shady areas."